Let’s look at the tariff plans in detail. The cheapest plan starts from Rs 149 per month, which offers free voice calls, 0.3GB of data, unlimited access to Jio apps, and 100 SMS. 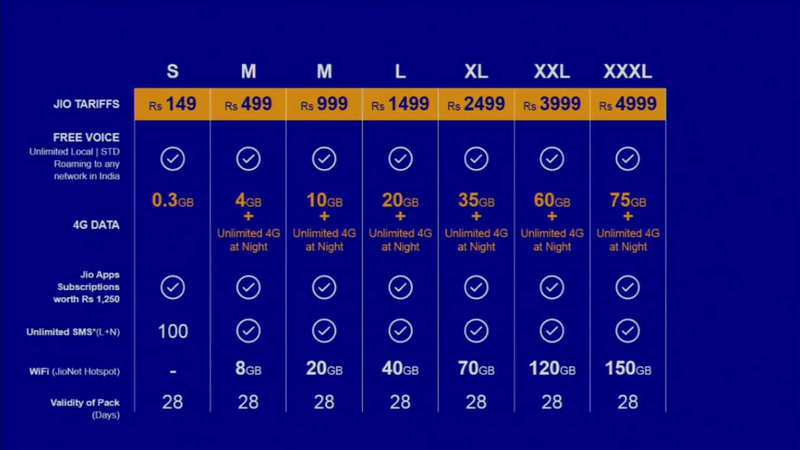 The Rs 499 per month plan offers free voice calls, SMS messages, access to Jio’s apps and 4GB data per month along with free unlimited data at night. Similarly, the Rs 999, Rs 1,499, Rs 2,499, Rs 3,999 and Rs 4,999 plans offer 10GB, 20GB, 35GB, 60GB and 75GB of data respectively per month. The free unlimited night internet usage is applicable from 2AM to 5AM. The tariff plans also include access to JioNet Wi-Fi hotspots, and the company plans to have a million such hotspots by next year. Rs 999 plan offers 8GB of Wi-Fi data, while the Rs 1,499, Rs 2,499, Rs 3,999 and Rs 4,999 plans offer 20GB, 40GB, 70GB, 120GB and 150GB of data respectively. Ambani also revealed plans with validity of less than a month, which have prices starting from as low as Rs 19 and going up to Rs 299. The Rs 19 plan offers 0.1GB of data, and 0.2GB of Wi-Fi hotspot data for a day. The Rs 199 plan offers 0.75GB of data, and 1.5GB of Wi-Fi hotspot data for seven days, and lastly, the Rs 299 plan offers 2GB of data, and 4GB of Wi-Fi hotspot data for a period of 21 days. click here to read jio tarrif plan image.